We’d love your help. Let us know what’s wrong with this preview of See How They Run by Ally Carter. Grace's past has come back to hunt her . . . and if she doesn't stop it, Grace isn't the only one who will get hurt. Because on Embassy Row, the countries of the world stand like domi Inside every secret, there's a world of trouble. Get ready for the second book in this new series of global proportions--from master of intrigue, New York Times bestselling author Ally Carter. To ask other readers questions about See How They Run, please sign up. Anyone else notice that the titles are nursery rhymes? Georgia Yeah - it's super cool. I think it's because a nursery rhyme plays a part in this book! The story isn’t the same, the characters aren’t the same, the pacing isn’t the same, and even the writing doesn’t quite read the same. But if Ally Carter does something well, it’s create completely distinct storylines. This is the sequel to ‘‘Embassy Row.’’ It picks up immediately after the ending of book one, after Ms. Chancellor’s revelation. I’ll have to say I liked this a little more than the first book. Ally Carter really w 3.5 stars. I’ll have to say I liked this a little more than the first book. Ally Carter really wrote a fast-paced story here. Because it was fast-paced, I read it almost in a single shot, despite some annoying scenes. Although I didn’t think it possible, there is more drama than in the first book. It makes things very intense. Maybe this is why Grace seems to always be in a state of dementia sprinkled with lots of reckless behaviour. But I was quite entertained by that, I must admit. I can criticize Grace all I want about being extremely immature, suicidal-almost and single-minded, but I’ve got to say it’s fun watching her fall into traps and getting herself in danger over and over again. Though there still is romance in this book, it is much less prominent. Thank God, because Alexei is just not my cup of tea. What is happening? I loved the romance in ‘‘The Gallagher Girls,’’ and I know Ally Carter can do better. So why doesn’t she? Not a perfect sequel, but a good one regardless. Also, huge cliff-hanger. You’ve been warned. THERE'S A TITLE HOORAY! ! This was quite a boring story for me, and I didn’t like it as much as the first book in the series. Grace spent most of this book whining; poor me, I did something unforgivable, and I’m feeling very sorry for myself now. Can’t say I really gave a damn. The storyline in this just dragged for me. I didn’t care what happened, I didn’t care who died, and I didn’t care how we got to the end I just wanted the book to be over. I spent most of the book wanting to hit my head against a brick wall, and wondering why the second book was so unenjoyable compared to the first book in the series. and so the plot thickens! ally carter is really taking the effort to make this a plot-driven and at times unexpectedly dark series. i suppose she succeeds, but one large hindrance in the story is the repetitive narrative and the unnecessarily dramatic lines that pop up on every few pages. "Grace," he says again. "What's wrong?" But a better question is: What's right? "Grace, what is it? What's wrong?" ...A better question might be what's right? Noah yells, but I am running down the beach like there is no looking back. And there isn't. Not for me. Not anymore. I step farther into the room, but Jamie just keeps folding and refolding clothes, trying to bring order to our messy world. pls. i could really do without the exasperatingly dramatic lines. the dramatic plot, on the other hand, i'm okay with. it's entertaining, although sporadic. the plot feels like a cycle of angsty internal conflict in the landscape of a troubled teenage mind put on loop with the occasional twist or turn. the ending was, i guess, a plot twist, so i feel like ally carter is making it a pattern to end these books with huge reveals. i think the side characters really took a back seat in this novel. noah felt like a decently developed character in the first book, but he was hardly present in this book. and what i mean by that is that even if he was in a scene, he didn't feel like he was really in the scene, if that makes sense. it was like his character development regressed. the same goes for rosie and megan. honestly, with grace (our main character) constantly repeating the same angsty lines in her internal monologue and the notably dramatic progression of plot events, this book can be a little exhausting to read. but it's absorbing, it's entertaining, and it's ally carter, so. good enough for me. If you, like me, love Ally Carter's books, I bet you were gutted when the US publication date for See How They Run was pushed up to December, and we still had to wait until January. I've been desperate for this book since I read All Fall Down. I pre ordered the book just before Christmas, but as soon as I saw that the book was available to review on NetGalley, I immediately had to request it, a I received an Advance Reader Copy from the publisher via NetGalley. This in no way impacted on my view. In See How They Run, action picks up not long after the events of All Fall Down. Grace is struggling to come to terms with the fact that she caused the death of her mother, and that the 'Scarred Man' - Dominic - is actually trying to protect her, and her mother, and wasn't intent on harming them. Life in Embassy Row is as normal as it can be, and then Grace's brother Jamie turns up, with one of his West Point friends. When Spence, the friend, turns up dead, and Alexei is the prime suspect, Grace is thrown back into the seedy underbelly of Embassy Row, as she tries to save Alexei from people intent on hurting him, and on hurting her family. I love Grace! Hands down, she is my favourite of Ally's protagonists. It's no secret that I adore everything that Ally writes, and she just keeps getting better and better. Grace is this fragile, hurt person, who feels like she's damaged, and doesn't deserve anyone's love or affection. In actuality, she has a group of people who love her, and would do anything for her. I just want to pick her up, and give her the biggest hug possible! Gracie deserves all the love she gets, and I know that the ending of this book - which I'll get to later on - will just break her up even more! Ally, please, don't hurt my Gracie! The secondary characters are just as wonderful as Grace, especially Alexei! I love them all, and meeting Jamie was lovely; he's the best big brother Grace could ask for. Noah, Megan, and Rosie are the same as they were in All Fall Down, and I adore how much they care for Grace - they are a proper group of best friends. Lila was a shock. After disliking her in the previous book, I was thoroughly surprised with how much I liked her now. Her and Grace have a begrudging friendship, and I want it to be explored further in the future. Now, Alexei. I'm sure most of you are a fan of him, like me ;P I swooned so much when reading his and Grace's interactions. Her loves her, even though he might not admit it. You can just see in his expressions, and though Grace might be oblivious, no one else is! Again, I think the conclusion of the book will have consequences for their relationship. Like I've mentioned a few times, this book ended with a cliffhanger! I was not expecting what was revealed until about a second before I read it on the page. I think Ally is trying to kill us all, leaving us like that! The only information about book 3 on Goodreads is that it is due in 2017 - I need more info! Actually, I just need more of the Embassy Row gang, like ASAP! Well I didn't see that ending coming.... now I am glad I picked up book three from the library when I picked this one up. I am not the biggest fan of Grace. I find her character a bit whiny and obnoxious but I like most of the other characters a lot. Especially Noah & Rosie. This is an unpredictable series so far so I have no idea what to even begin to expect for the final book! Aaaaaaaaah! I need book 3!!!!! See How They Run is the second installment in Ally Carter's Embassy Row series. Picking up where All Fall Down left off, 16-year old Grace Blakely's past has finally come back to haunt her. So much so that her mind is drifting neither here nor there, and certain events that happened in the previous installment are not all that clear. This is the book that readers who have read All Fall Down will want to pick up as soon as it is released. This is a book that is as mysterious as it is heart breaking. Really sad to have to give this book 2 stars but it just wasn't as purely brilliant as 'All Fall Down'! I thought Grace's thought patterns were very repetitive, and so was the knowledge she gave us. We all ready knew her biggest secret from 'All Fall Down' and I didn't need to be reminded of her fragile mental state on every page. For me, not enough satisfying things happened. There were cute moments between Grace and Alexei, and definitely more backstory built around the country of Adria, but i Really sad to have to give this book 2 stars but it just wasn't as purely brilliant as 'All Fall Down'! I thought Grace's thought patterns were very repetitive, and so was the knowledge she gave us. We all ready knew her biggest secret from 'All Fall Down' and I didn't need to be reminded of her fragile mental state on every page. For me, not enough satisfying things happened. There were cute moments between Grace and Alexei, and definitely more backstory built around the country of Adria, but it just didn't grip me the same way 'All Fall Down' did. I CAN'T BELIEVE IT. I KNEW IT BUT I DIDN'T KNOW IT OH GOD. Ally Carter and secret societies is my new favourite thing. I feel like Ally went somewhere with this book far beyond what she usually does. I love the history of Adria and the role of an underlying secret bigger than just one person. Okay, so Grace isn't a Cammie Morgan or a Kat Bishop. She's much harder to relate to and reading from her perspective is always a head-rush but I appreciate her so much. I like that Ally ne I CAN'T BELIEVE IT. I KNEW IT BUT I DIDN'T KNOW IT OH GOD. Okay, so Grace isn't a Cammie Morgan or a Kat Bishop. She's much harder to relate to and reading from her perspective is always a head-rush but I appreciate her so much. I like that Ally never compromises on Grace's traumatic experiences and how they've affected her. There's a lot more Alexei in this book and it's a great thing (cause that damn that swoon factor is almost at a Zachary Goode level) but then it's also a terrible thing cause I was just uttering "omfg Alexei" every few pages. I was so glad Jamie was in this book. I love him so much. And of course, the entire gang is back. Noah, Megan, Rosie and Lila all make for a great squad. Minor complaints may be that the pacing is incredibly fast but it also makes for constant action and I can't complain too much about that. Ally writes a short book that delivers the same punch a larger more slow-paced book would. I will give this series one more shot (because the ending was too big of a cliffhanger) but the whining and the poor me attitude has to stop or I am done with this series. I only gave it two stars because Carter is a great author and I love her other series. this book was a struggle for me, I know a lot of people love it but I would prefer Carter to write another Heist Society book than continue this garbage. I know people love it so maybe this is just me, but seriously can we get another Heist I will give this series one more shot (because the ending was too big of a cliffhanger) but the whining and the poor me attitude has to stop or I am done with this series. I only gave it two stars because Carter is a great author and I love her other series. The level of anxiety and guilt is off the charts and yet I'm reading book #3. Damn my weakness for russian characters. Carter's writing herself into a bit of a rut, I think. This series tries to be different with a protagonist who thinks she's losing her mind (frankly, the vacillation isn't as well done as it needs to be for that to be properly pulled off) but ultimately the author falls back on secret society roots, and there isn't enough story or explanation in this novel to make that a workable plot element. (view spoiler)[There's a society of women who secretly run history, because of course there is, and a Carter's writing herself into a bit of a rut, I think. This series tries to be different with a protagonist who thinks she's losing her mind (frankly, the vacillation isn't as well done as it needs to be for that to be properly pulled off) but ultimately the author falls back on secret society roots, and there isn't enough story or explanation in this novel to make that a workable plot element. (view spoiler)[There's a society of women who secretly run history, because of course there is, and a weird situation where four women give up their kids to hide the baby princess - seriously? SERIOUSLY? And then, of course, there's a matter of knowing who the princess was anyway, and where her descendant currently is. (hide spoiler)] It's all so stupid. There are a lot of plot twists just for the sake of plot twists, and a lot of awkward writing, a lot of metaphors that start one place and wind up someplace else. It's beyond mixed metaphors - it's confusing writing and poor juxtapositions. "My sister? Oh, she could absolutely kill someone. But then she'd look you straight in the eye and tell you why she did it and how much better off the world is for her bravery. Lila might be a killer, in other words, but she's no liar." You understand that he's talking about his sixteen-year-old twin sister? Talk about damning with faint praise. And Noah's supposed to be a nice guy. Yikes. Then there's the whole "You're friends with a Russian?" thing, which - ugh. And things have shifted enough with Iran that this new book already feels dated. So you’re a secret society… of librarians? Not gonna lie, I wasn't the hugest fan of the first book in this series. Sure, I liked it, but that was it. This one blows the first one out of the water spectacularly. Ally Carter ups the stakes and increases the tempo, and even puts a sneaky cliffhanger in there. I did have a few issues with it, but it was mostly just little irritations. For one, there's the I-shouldn't-kiss-you-because-you're-my-friend's-sister trope going on, which, honestly, are we not past this? She has a mind and desires of her own, you know. And really, you're almost sabotaging your relationship if the only way you can think of her is as your friend's sister. Then there's the overprotective-big-brother trope. Again, doesn't she have a mind/will/desires of her own??? Spare me this. Also please spare me the boys-fighting-over-her thing. I'm tired of it. I think this was my MOST anticipated read of 2015. Trust me, it didn’t disappoint. With lots of action-packed scenes and maybe a few tears, See How They run lived up to my expectations. Okay, so All Fall Down ended on such a cliffhanger. See How They Run picked up right after the first book ended. The overall storyline was AMAZING. I don’t think I liked it quite as much as the first book, but it is still so so so so good. I really loved the character development. All the characters grew and developed beautifully in this book and I really felt like I got to know the characters better. I loved all the world-building also. You really got to know more of the world outside Embassy Row. That was very enjoyable. Plus, the book is totally clean! Maybe a few kisses and the sort, but no language or inappropriate content. It does have violence, but not so much that it’s overwhelming. Hmm. Okay, I can see how others enjoyed this one. Very similar to the first book in the sense of content. It did still have a sad theme, though. Understandable, of course, but still not necessarily a happy plot by any means. I'm going to murder someone now. I had a theory, a theory that was kind of out there, a theory I thought, nah, it wouldn't be. THEORY CONFIRMED ON A BLOODY GREAT CLIFFHANGER. Mean. I'm trying to decide who I love more - Alexei Volkov from this trilogy, or Zachary Goode from Gallagher Girls. It's really hard, because they are both a m a z i n g.
The Embassy Row series is on FIRE, and I love how breathless I become as I turn page after page after page, waiting for the shocking twists to calm down yet hoping dearly that they don't. Spoiler: they don't. There are murders, secret Societies, explosions, treasure... and handsome boys turning into wanted fugitives like that. *snaps I'm trying to decide who I love more - Alexei Volkov from this trilogy, or Zachary Goode from Gallagher Girls. See How They Run did not disappoint. - the utterly breathtaking twists and turns. This installment is nearly impossible to put down. - Grace's friends (by which I mean Noah, Megan, and Rosie). They love her so much. <3 They care about her, they want to help her, and they are THERE FOR HER. I admire that greatly because Grace is... difficult. - the setting. The whole feel of this book was an attractive kind of mysterious. I love the island so much, as well as all the underground tunnels/passageways. The Festival of the Fortnight raises the tension throughout, and I'll never get over how cool the whole Embassy Row thing is. The United States is right next door to Russia. Iran is kind of abandoned. Walk a way's down the street and you'll be at Israel's doorstep. FASCINATING, NO?? - the main character, Grace. *sigh* Look, I understand why she hates herself. (view spoiler)[After all, by the end of book 1, she remembers that she kinda sorta shot and killed her own mother. (hide spoiler)] But I couldn't help but dislike her. She won't stop beating herself up and thinking/saying over and over again, "I'm not okay. I'm not fine. I'm dangerous. I'm a monster. Everyone should hate me, and I'm angry they don't..." and it annoyed me to no end. It's probably realistic, considering, but STILL. UGH. - the writing style. I'M ON THE FENCE HERE, 'KAY?? At first I didn't mind Ally Carter's unique style, but now it's getting on my nerves. It's the kind of style that captures you, draws you in, has you gripping the edges of your hardcover copy like someone might try to rip it out of your hands. And for that I like it. A lot. It's darn good writing. But at the same time, something about it irritates me. See how they run is the second book in Ally Carter's newest series, Embassy Row. The first book, All Fall Down, was an ultimate beginning to the series which I gobbled up all in one day. Yesterday, the exact same thing happened when my brother got me the personalised signed edition for Christmas. I read the whole 323 pages before you could say egg nog. Embassy Row went from awesome to extremely awesome. 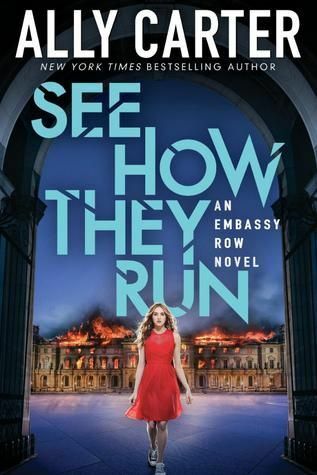 See How They Run was much more thrilling than All Fall Down and I don't even know how that is See how they run is the second book in Ally Carter's newest series, Embassy Row. The first book, All Fall Down, was an ultimate beginning to the series which I gobbled up all in one day. Yesterday, the exact same thing happened when my brother got me the personalised signed edition for Christmas. I read the whole 323 pages before you could say egg nog. Embassy Row went from awesome to extremely awesome. See How They Run was much more thrilling than All Fall Down and I don't even know how that is even possible. I also thought that the end of All Fall Down had one of the greatest plot twists in YA history, boy have I been wrong. By the end of the book, I was like YES NO YES NO OMG WHAT DID I JUST READ. Ally Carter went full out on See How They Run. I wish I could give her a high five for this fantastic book, or a punch to the gut for twisting my feels and making us readers wait a whole other year for book three. Ally Carters builds the world the story takes place in so much, Adria has a deep rich history which I am definitely intrigued in! In this installment, Ally Carter took the characters and blew them up. We got more Alexei, Ms. Chancellor, Dominic and Lila. Now no one is good and no one is bad. I am so confused for my feelings. The secondary characters from book one have been developed and given depth. Graces squad continues to grow and there are so many moments of humour and others of despair. I loved this book just as much as I love Alexei. For your information, that is beyond the stars. Jamie was brought into this book and it added so much more to the plot. I still don't know how exactly how I feel for him. He is a douche, but he makes a great brother, but he is still a douche. With Jamie came a friend which only introduced another story which blew up and took over all my attention. and time. Do you know how much work I did the say I was reading? None. So worth it. The mystery is massive, so much better than heist society and Gallagher girls. Politics is mashed into the story and adds a whole other thing to it all. Ally Carter has always been a master plot twister. She always manages to develop the best plot ever. Its so smart how a lot of things match up together. Some readers claim the twists are predictable, but I didn't feel that at all. I was blown away with every page. I do wish that Ally Carter would have taken the time, See How They Run was very packed together, I feel that some scenes could have been developed further to extend our understanding of the happenings. I love Grace so much more in See How They Run compared to All Fall Down. She comes off as less whiny and is capable of doing so much more. She becomes stronger and smarter with every page. She is made of pure determination and I admire that so much. *4.5 stars* Why not 5?? I really did like this book, don't get me wrong. I just didn't feel like it was executed as well as All Fall Down. Grace was SO frustrating in this book! I know she had a traumatic past and everything, but she KEPT. DWELLING. ON. IT. Sure, I've never been in the situation she's been in, but it was aggravating for her to mention her past and her sorrows and her fears and her worries every three pages! I tried to relate to her, but failed. However, on the light side, I love *4.5 stars* Why not 5?? I really did like this book, don't get me wrong. I just didn't feel like it was executed as well as All Fall Down. Grace was SO frustrating in this book! I know she had a traumatic past and everything, but she KEPT. DWELLING. ON. IT. Sure, I've never been in the situation she's been in, but it was aggravating for her to mention her past and her sorrows and her fears and her worries every three pages! I tried to relate to her, but failed. However, on the light side, I loved Alexei even more in this book! I felt like he went through a lot of character development, which I appreciated. As did Lila, come to think of it. I say she's the doppelganger of Macey from the Gallagher Girls. ;P I really missed the Noah/Rosie/Megan/Grace team that we had in All Fall Down, BUT, I love Jamie, so I guess that makes up for it. I really liked the mystery in this book and the different areas that were explored outside of Embassy Row. This book was definitely creepy. Just saying. And that plot twist at the end! Mind. Blown. I NEED THE THIRD BOOK!!! This was a really good book. I just wish Grace could forget about her past, that's all. I completely recommend this book, especially if you have read All Fall Down! Language: None/Mild. One use each of "freaking" and "screwup." Romance: Mild. A couple of kisses and a late night swim between a boy and girl. Violence: Mild/Moderate. Stabbing, shooting, explosions, and some description of blood. Not bad. I absolutely love Ally Carter books. She has a way of gripping you from the start and living the adventure along with the heroine who is not only trying to solve mysteries but also struggle with the reality of growing up. Of course these stories wouldn't be complete without the subtle love interest which is one of my favourite parts. Grace is everything I expect to see from an Ally Carter heroine with the added twist of everyone thinking she might be a tiny bit crazy. I love Alexei and loved get I absolutely love Ally Carter books. She has a way of gripping you from the start and living the adventure along with the heroine who is not only trying to solve mysteries but also struggle with the reality of growing up. Of course these stories wouldn't be complete without the subtle love interest which is one of my favourite parts. Grace is everything I expect to see from an Ally Carter heroine with the added twist of everyone thinking she might be a tiny bit crazy. I love Alexei and loved getting to know Jamie. Will the visions ever end? Returning to Adria, brought back Gracie down memory lane. Her mom was killed, and although she blamed the wrong man for years, Gracie finally remembers the truth : she shot her mom. But now that her crush, Alexei, is in trouble with the law, can Gracie be of service or will her back luck hinder the case even more? I won't go over Gracie's self-hate, because, although unjust, it's completely understandable. She feels like a murderer who deprived everyone who cared for her Will the visions ever end? I struggled through the first 200 pages of this book because the protagonist, Grace, is such a self-loathing, self-righteous character that I could barely stand to read on. But, exactly like the first book, the final pages are where things get really good and it definitely ends with another crazy twist. So every time I told myself I would not be continuing the series while reading this all went out the window in the finals pages. Looks like I will continue with Grace's annoying attitude because I struggled through the first 200 pages of this book because the protagonist, Grace, is such a self-loathing, self-righteous character that I could barely stand to read on. But, exactly like the first book, the final pages are where things get really good and it definitely ends with another crazy twist. See How They Run is the perfect sequel to All Fall Down! It is very fast-paced and suspenseful, even more so than the first book, and combines mystery with politics. A strong and likeable main character makes this book even more enjoyable. I really recommend this series to everyone! See How They Run is a super fast-paced novel. And I really mean it when I say fast-paced. This book gives little time for the reader to process all the events before diving into another plot twist. I honestly read this book in just one sitting because I couldn’t find the right spot to put it down. This is such a quick read that is sure to blow the reader’s mind. Ally Carter has crated See How They Run using an interesting mix of genres. It combines mystery/thriller and politics. I actually haven’t read too many books about politics, so this book was very different for me. What I really enjoyed in See How They Run were the embassies. The main character in this series lives in an embassy row with her dad, the US Ambassador. Living next door to Grace is the German Ambassador. There are so many puns about causing international accidents, since two very different countries are two feet away from each other, which I found to be pretty clever. I absolutely loved the character of Grace in See How They Run. I felt really empathy towards her because she goes through so much in the book. There are so many tragedies and occurrences that she has to endure. Grace also suffers with PTSD, which makes it even harder to act like a “normal person.” Grace is so strong and remains strong, so you can’t help but love her. See How They Run is a fast-paced read with a unique combination of genres. There is a brave and lovable main character who adds so much drama and suspense to the novel. If you have not yet read the first book in the Embassy Row series, All Fall Down, I definitely recommend that you do so, since these books are absolutely incredible. GUYS ALLY CARTER. What can I say?? Every time I read or re-read one of her books I wish I could be half as good at plot lines and interesting characters as her. And the action! See How They Run moves incredibly quickly, I had to pause to remember everything that had happened. I can't help loving Grace. I forget that she's not a child. I love her inner dialogue, I love that her PTSD isn't treated as a joke, and Carter seems to have done the research to represent it properly. The guilt and trauma GUYS ALLY CARTER. What can I say?? Every time I read or re-read one of her books I wish I could be half as good at plot lines and interesting characters as her. And the action! See How They Run moves incredibly quickly, I had to pause to remember everything that had happened. I can't help loving Grace. I forget that she's not a child. I love her inner dialogue, I love that her PTSD isn't treated as a joke, and Carter seems to have done the research to represent it properly. The guilt and trauma Grace lives with is explored fully. The end of All Fall Down was just the beginning of this series. The plot is thickening fast! At the end of See How They Run, there is a plot twist that I think will lead this series in yet another direction. I like that I can never guess what comes next. See How They Run isn't your typical murder mystery, its a mash up of different genres, which I love. There's the political side, the murder, the things Grace has gone through, and on top of that, she's still a teenager trying to work her life out. Boy's in the romantic sense aren't a main focus, which is also great. I think for some people that Grace could be quite annoying, but I find her interesting. The writing of this book really reflects Grace's personality. She repeats things and comforts herself and second guesses what she's doing. There's no fluffing around with lengthy descriptions. The style is very different from Ally Carter's other series, but I like it. Okay... I feel kind of numb after reading this book. Everything happened so fast in the end and I'm still trying to process the mind blowing thing that happened. At the same time I'm thinking: Why is the next book so far away? ?